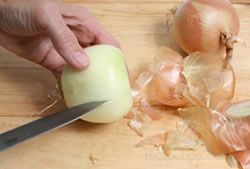 Irritation to the eyes, which causes tearing, can be a problem when working with onions. 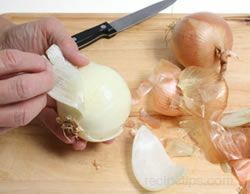 Before beginning any type of prepartion on the onions, see Tearing Tips for information that can help you eliminate or minimize this problem. 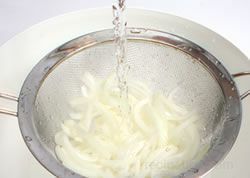 Rinse the onions off under cold running water and then remove dried, wilted layers. If green tops are wilted or damaged, cut off damaged tops. Trim off the root ends and then the onions are ready to be served whole. 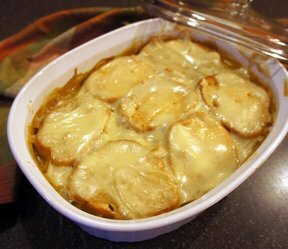 They can also be thinly sliced when called for in a recipe. 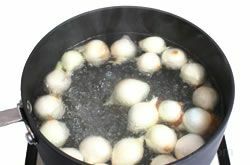 To peel pearl onions or other small varieties, place the onions whole into a saucepan of boiling water and allow them to boil for two minutes. 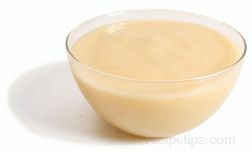 Drain and place in cold water to stop the cooking process. 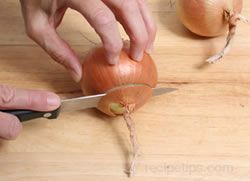 When cool enough to handle, trim off the root end of the onion. 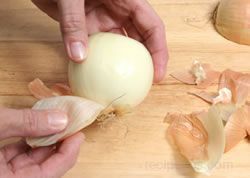 From the stem end, squeeze the onion between your thumb and forefinger. The onion should slip right out of its skin. Make a crisscross cut about 1/4 of an inch deep at the root end to prevent the inside layers from coming out during the cooking process. 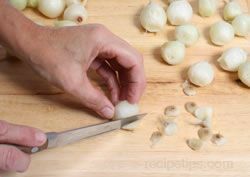 To get the best quality out of your onions, they should be cut just before you are going to use them. If you need to slice ahead of time, they can be sliced and stored in water in a sealed container for 3 to 4 hours in the refrigerator and still retain their freshness. 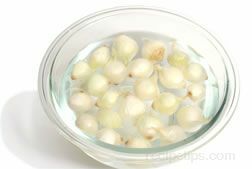 Some preparation methods for dry onions are shown below. 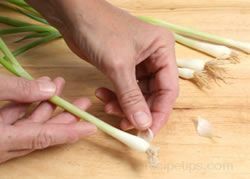 Trim off the stem end of onion. Cut the onion in half lengthwise from stem end to root end. 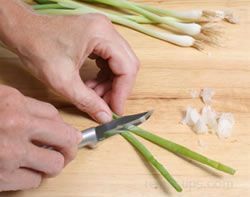 Trim off the stem end only if cutting slices or chopping the onion. 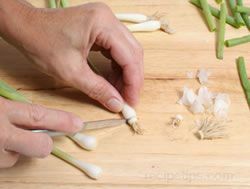 If cutting into quarters, trim off the stem and root ends. 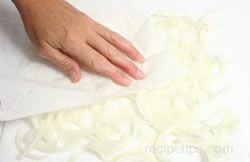 Peel off the dry, papery outer skin and also the next layer if it is damaged or beginning to shrivel. 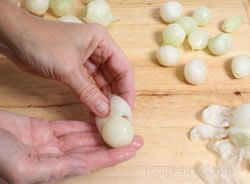 The onion half is then ready to be quartered, sliced, or chopped. Crosswise Slices: Peel half onion as shown above. 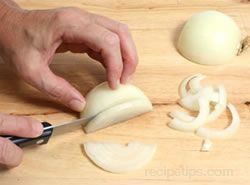 Place onion half cut side down. 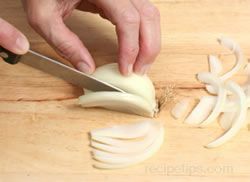 Cut onion crosswise to desired thickness to create half slices. 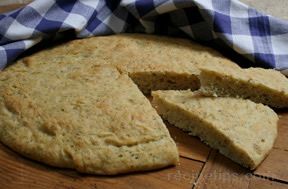 Cutting crosswise will create slices that will soften faster when cooked. 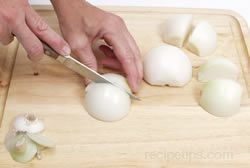 Lengthwise Slices: To create slices that are firmer textured, cut the onion half lengthwise when cutting the slices. Cut slices up to the root end but do not cut through it. 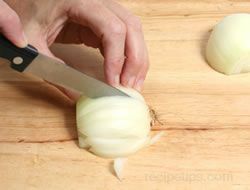 Some of the outside slices will detach from the onion but the inner slices will be attached to the root. After cutting all the slices, trim off the root end to separate the slices. Cutting the root end off last will help minimizing tearing. These firmer lengthwise cut slices will hold their shape better when cooked. 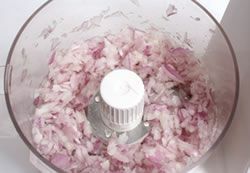 Chopping can be accomplished manually with a knife or the onions can be placed into an electric blender or food processor and chopped very quickly. Cut the onion in half lengthwise through stem and root end. Peel halves as shown above. Leave root end intact. 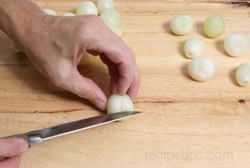 Place onions cut side down on a cutting board and make 2 or 3 horizontal cuts at 1/4 inch intervals in each onion half. 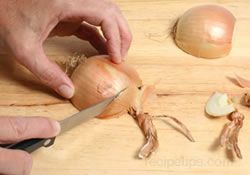 The number of cuts will depend on the size of the onion. Cut through to the root end but do not cut through the root. 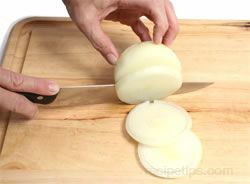 After making horizontal cuts, make thin lengthwise slices through the onion half but do not cut through the root end. 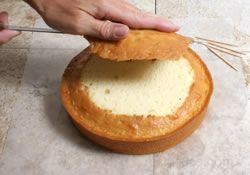 Most of the slices should still be attached. 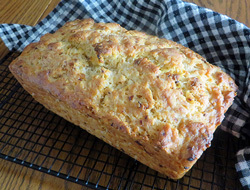 Make lengthwise slices 1/4 inch or less in width. 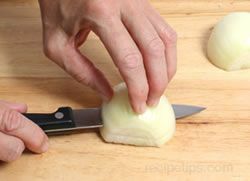 After cutting the onion half into lengthwise slices, hold the onion firmly and cut the onion slices crosswise at 1/4 inch intervals to create chopped pieces that are approximately 1/4" square. Repeat process with the other half of the onion. 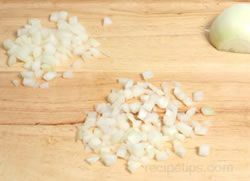 Begin by chopping onions into 1/4 inch pieces as shown above. 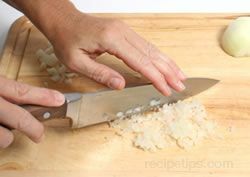 Continue to cut the chopped onions with a sharp knife until they are cut into fine pieces. 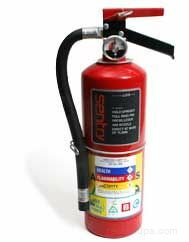 Pieces generally measure 1/8 inch or smaller. 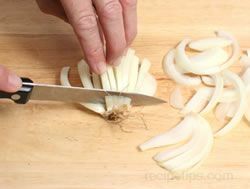 Chopping onions with a processor is quicker than chopping manually but it will produce inconsistent size pieces. 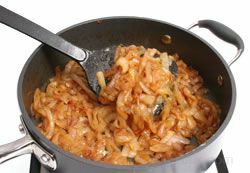 If the onions are going to be used for cooking, the inconsistent size pieces will result in uneven cooking. Peel and quarter the onions. 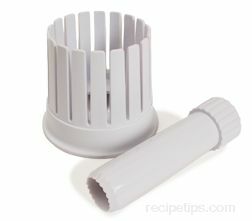 Place the quartered sections in the processor that has the metal blade attached. Pulse the onions 3 times for no more than 1 second each time. This will produce coarsely chopped onions. 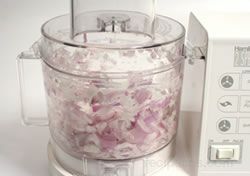 For a finer chopped onion, scrape sides of processor bowl and replace the cover. Pulse one or two more times. 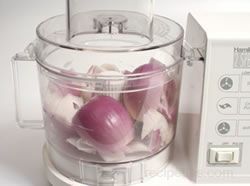 Chopping with a processor produces onions that are wetter than when chopped by hand. 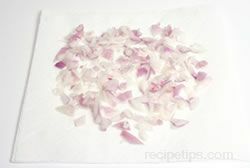 To remove some of the moisture, place the onions on a paper towel and allow some of the moisture to seep into the towel. 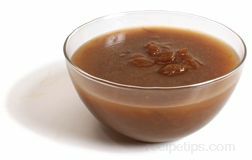 The harshness of a strong onion can be reduced so that it can be used in dishes where you do not want the strong flavor. 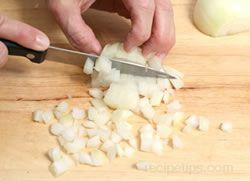 Prepare onions by slicing or chopping and then place in a bowl of ice water. 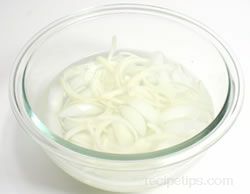 Soak the onions in ice water for 60 to 90 minutes. Change the water 2 or 3 times during this time period.